We’ve been building the finest upholstered furniture for over 50 years, but it was tremendous demand for purpose-built home theater and media room seating that spawned Front Row in 2004. Since that time, we’ve consistently delivered exceptional solutions to demanding enthusiasts across North America. No two rooms and no two people are exactly alike, so we offer a wide variety of traditional, contemporary, and modern designs in multiple configurations. From more than 15 dedicated home theater styles to more relaxed sofa and chair options, Front Row has something for everyone. We still build everything by hand in our Canadian factories utilizing premium materials and old-world construction techniques honed over half a century. We start with the finest dried hardwoods: frames are glued, doweled, screwed or stapled, and corner-blocked for maximum performance and durability. 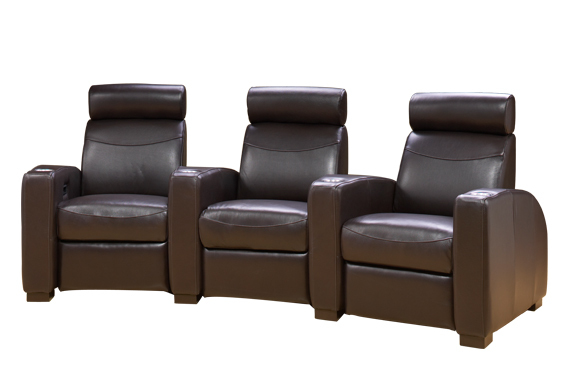 We utilize heavy-duty (no-sag), squeak-proof springs, high quality foam wrapped in Dacron, industry-leading Leggett & Platt mechanisms, and the finest fabrics and top-grain leathers to bring you the most comfortable seats possible. We want your seats to wear evenly and to be just as comfortable ten years from now as the first time you sit in them. Don’t be fooled by cheap imitators. We stand behind our products. In the unlikely event your Front Row product requires warranty service, we come to you. Frames, springs, and mechanisms carry a limited lifetime warranty against manufacturing and material defects under normal household use. Foam cores, stitching, and covers (subject to proper care) carry one- to five-year warranties. Each Front Row order is custom built to meet your exacting specifications and we wouldn’t have it any other way. Incorporating your choice of style, cover, and options, your personalized seating is delivered in six to eight weeks.